Fluke Process Instruments recently introduced the SpotScan line scanning accessory for the Endurance, Marathon, and Modline ranges of IR non-contact temperature measurement sensors. The accessory features a scanning mechanism that enables users to gather temperature data over a larger area on the target. SpotScan helps optimise the performance of IR thermometers in applications ranging from metals processing and induction heating, to carbon graphite production. 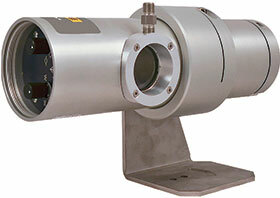 It is especially well-suited for web and conveyor hot spot or cold spot monitoring. With the accessory, industrial facilities can continue to utilise the advanced optics of their Fluke IR temperature sensors to achieve small spot sizes on the measurement target, but also ‘spot sweep’ over the target to monitor a larger area, thus obtaining additional information on critical production processes. Users can see a hot spot over a larger area and continuously monitor the analog output for temperature variations that exceed defined limits. This allows plant operators to employ signal conditioning sensor capabilities to obtain temperature information in a variety of different ways. For example, use of the ‘peak picker’ function helps identify hot spots over a larger area. The averaging/response time functions provide average temperature over an extended range. In either case, operators benefit from an expanded view and increased awareness of process conditions. Units are also available with options for sighting the IR instrument and periodically checking sighting accuracy. On-board controls make it easy to manipulate the end or centre positions of the scan, as well as its frequency. For sensors equipped with a laser, the user can simply turn the unit on to see exactly where the sensor is aimed. For units equipped with through-the-lens sighting, scanning at the end points can be stopped to make necessary aiming adjustments. The SpotScan line scanning accessory utilises the existing sensor DC power supply. Its durable IP65 enclosure is designed to withstand ambient temperatures up to 60°C and an air purge option is available for use in dusty environments.